For the first time in a while, oil prices did not fall lower this week, though that speaks more to the extremely weak opening price than to any market strength. The trade has tested a rally a few times this week, but prices seem to stick around $52 before sinking back to $50. 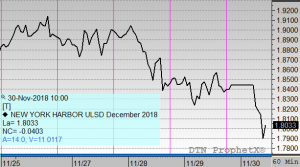 That up-and-down pattern has dominated the patterns this week, though a G20 meeting today and the OPEC meeting next week should provide more clarity to the market in the days ahead. After several hard drops from $75/bbl down to just $50/bbl, traders are wondering whether $45 is the next step in crude’s path. As we noted earlier this week, the trek from $55 to $50 was driven largely by put options that caused significant selling once prices broke that threshold. The fact that prices have not held below $50 this week seem to indicate that markets aren’t interested in moving any lower. Crude began the week at $50.62, at the time the lowest opening price in years. The product made a few attempts at rallying, but each one was quickly squashed by sellers taking advantage of the rally. Rallying to $52 on Wednesday, the EIA’s bearish report caused oil to turn lower settling below $52 on Wednesday and setting a new multi-year low on Thursday when prices briefly fell below $50. This morning crude opened at $51.27, a very small weekly increase of 65 cents. Diesel prices took a big hit this week, much to the benefit of consumers. While gasoline has been steadily falling for a while, diesel generally showed strength through the bear market until the last two weeks. In just two weeks, diesel has fallen from above $2.00/gal to below $1.80. This week, diesel opened at $1.8776, coming off the tail of a ten-cent drop last Friday. This morning diesel opened at 1.8406, a loss of 3.7 cents. 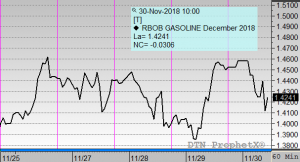 Gasoline prices are trending up the highest across the petroleum complex, thanks to a mid-week report from the EIA showing a surprise draw from gasoline inventories. Gasoline opened at $1.3917 and sank to a fresh low at yesterday’s open, but has since climbed to open this morning at $1.4461, a 5.4 cent gain.